A series of triple lenticular photographic prints, representing historic and contemporary images based on artist-conducted research. 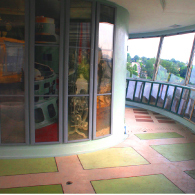 Prints are situated under the windows surrounding the interior elevator deck, on the elevator housing facing the deck entry and in the access tunnel. The prints are enhanced with a floor treatment on the deck, consisting of engraved concrete imagery, composed of geometric shapes based on historic city maps elicited through artist research.